Total Control Over Your Powerful Setups! 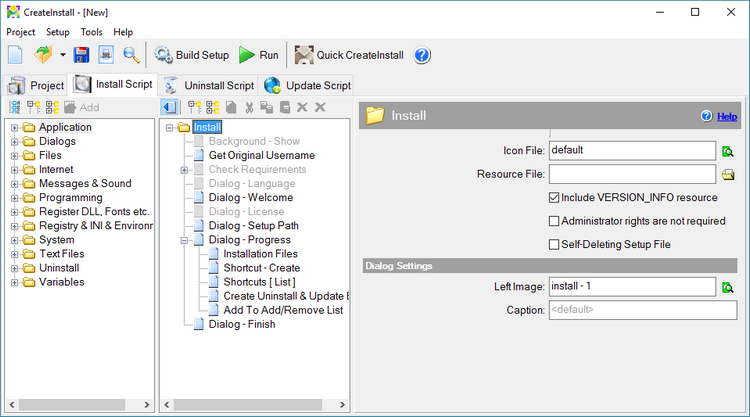 CreateInstall is a versatile tool for the creation of application installers and self-extracting archives. CreateInstall is a specialized software product that allows you to control the entire installation process for your applications. This handy installer enables the specification of command sequences. Once the program complexities have been mastered, CreateInstall can be used as a highly powerful and flexible tool. You can create installation scripts as needed. There are many predefined script commands and you can create customized actions. CreateInstall has an impressive set of features including the built-in Gentee programming language, which can be used for the creation of installation scripts. Gentee is a structured programming language that provides the tools to create installation scripts as simple or sophisticated as you wish. You can modify dialogs, and add your own resources and controls. Also, the source code for the script commands is available. CreateInstall Copyright © 2007-2013, Novostrim. All rights reserved. Gentee Programming Language Copyright © 2004-2013, The Gentee Group.